Well, I’m also one of those guys that has about 15 windows open at any given time… browsers, spreadsheets, Dreamweaver, Outlook, Explorer, etc. I find that I often need to quickly get access to my desktop to edit, move, or upload a file. Hitting the minimize button on each window isn’t an option, and the “Windows Key + D” command just isn’t comfortable to me. So, having the ability to hit a single button where my finger is already hanging out is just super convenient! Up until a year ago my software allowed me to easily set this middle button, via a pull down option, to one of many things. Minimize All was there and so mapping that function to the button was just super simple… well, that changed and so this is why I’m writing this post! NO OPTION FOR MINIMIZE ALL? Oh my gosh you’ve got to be kidding me! Well, I wasn’t going to trash my keyboard for the lack of minimize all, so I resigned myself to simply using the “Minimize” option which just minimizes one at a time. I can hear you geeky types now, “Just assign the keyboard command “WindowsKey + D” as a “Keystroke Assignment”! Yeah, well, I tried that about 20 times and the software doesn’t recognize the WindowsKey! Find or create the application that minimizes all called “Show Desktop” (instructions on how to create a minimize all shortcut here). My keyboard allows me to map to a program of file, but of course my mouse does not. I read the instructions on how to create a keyboard shortcut (bottom of page) to a program. After some trial and error I realized I had to create a regular desktop shortcut to the “Show Desktop” application (copy it and paste as shortcut) to my desktop. I then clicked “properties” on this shortcut and assigned ctrl+alt+9 to that shortcut. Finally, into the Logitech software I went and assigned my Middle Button to the new key command, which triggers a shortcut, that triggers the “Show Desktop” command that actually minimizes all the windows…. PHEW! Hey Sharad, thanks for the comment. Yes, the windows + d key works great for me too, but I’m not a huge fan of keyboard shortcuts, especially ones that take two keys at once. I’m often doing a lot of browsing, file moving, etc. with just my mouse (head rested on other hand) and love having the middle button on my mouse do a minimize all. For some lame reason Logitech’s software doesn’t support the windows key combinations. 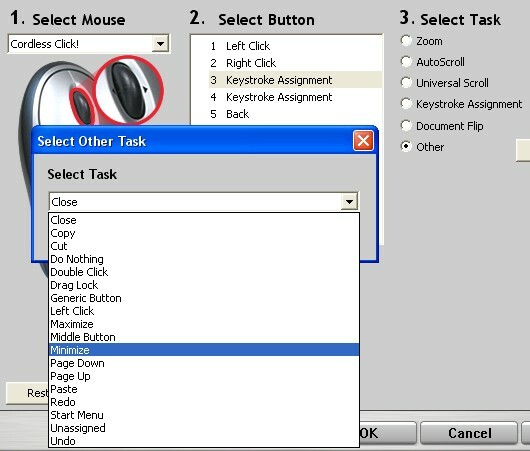 Luckily for you with windows 7 and the new logitech setpoint software you can set the middle button to show desktop!! Hooray!! Great, thanks! Minimize all on my trackball is so useful. I used to just use Winkey+M but my lappy has the ‘Fn’ key right next to it. No matter how many timesI’ve done it, I still hit ‘Fn + M’ instead. Now assigned to the Draglock button – cool.